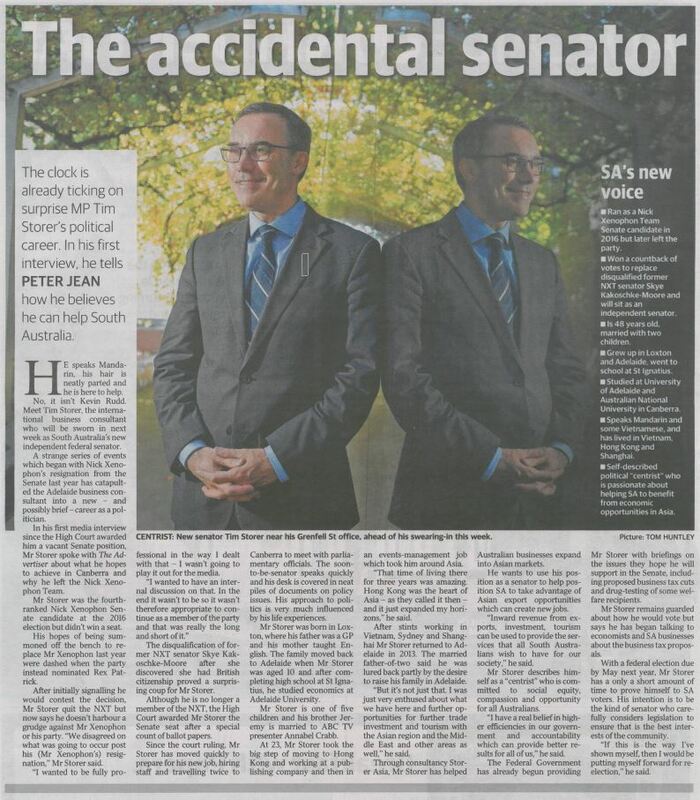 What a great read - New big role for Old Ignatian and New Senator Tim Storer from the Class of 1986. 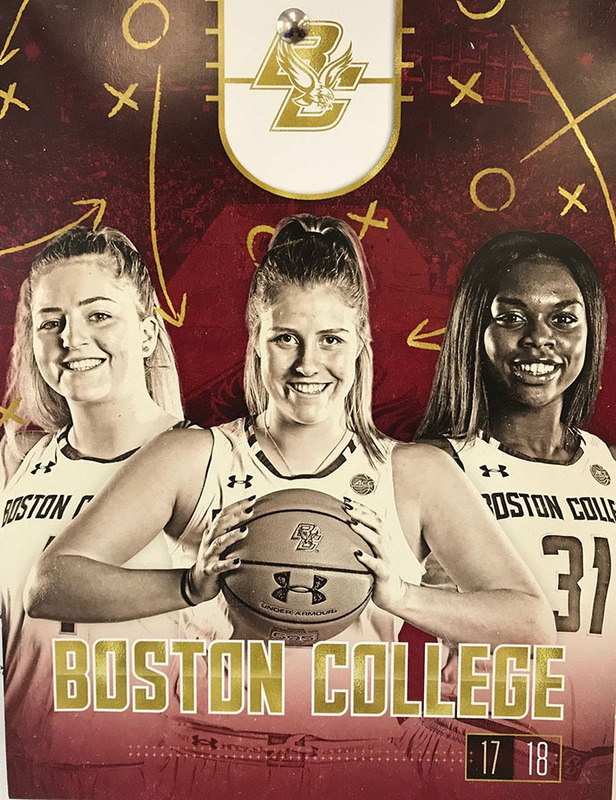 Spotted in the Senior School Staff room: Old Ignatian, Taylor Ortlepp from the Class of 2015 in the 2017/2018 Women’s Basketball Roster for Boston College (USA) where she is currently playing in the NCAA Division I. 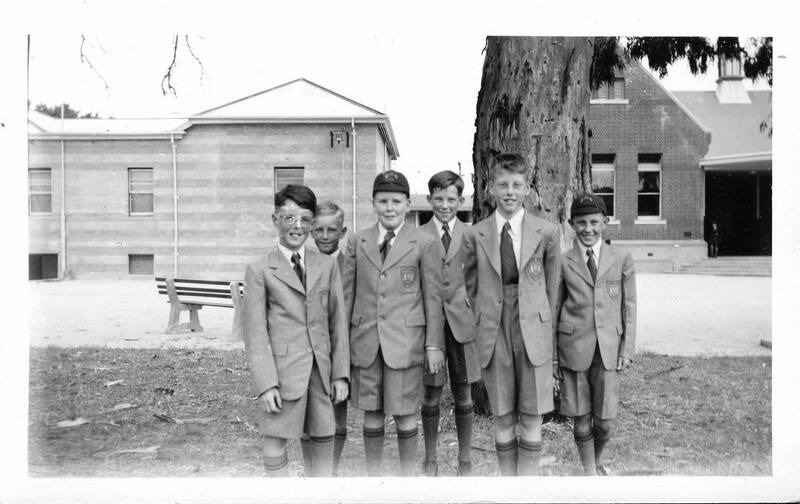 The 13th of February 2018, marks 67 years since Saint Ignatius’ College commenced at Norwood in 1951. SPOTTED: Old Ignatian and OIA Vice President, Sam Hooper (Class of 2007) and his partner Bec Butcher were featured in the Money Saver Section of the advertiser this month. The OIA would like to congratulate Old Ignatian, Brigid O’Farrell White (Class of 2011) who has been awarded a Rhodes Scholarship for 2018! Brigid joins Yen Pham (Class of 2010) and John Doyle (Class of 1962) as winners of this prestigious scholarship and we are delighted to congratulate her on this wonderful achievement. 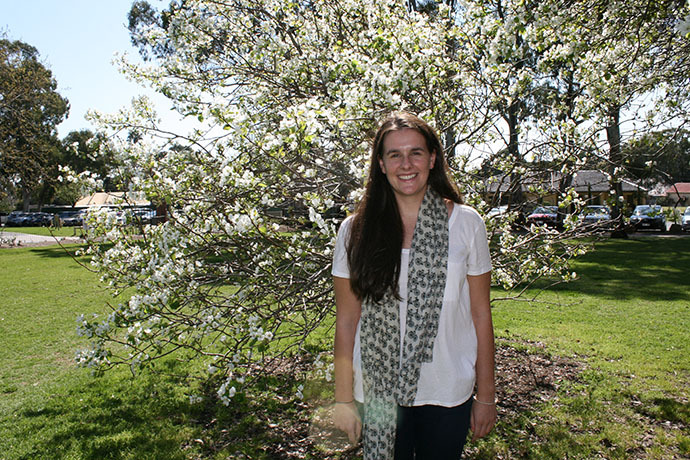 Since leaving Ignatius, Brigid has studied at the University of Melbourne and in Nanjing, China. More recently, she also spent six months studying Arabic in Cairo and volunteering with refugee rights organisations in Egypt. In February this year, Brigid will undertake an internship at the UN Human Rights Council in Geneva. She has also assisted in the past with organisations supporting people with disabilities including Interchange and Special Olympics Victoria as well as contributing to educational development projects in PNG through the provision of literacy resources for elementary schools. Saint Ignatius’ College encourages its graduates to be life-long learners and to make our world a better place because of their presence in it. Brigid is a great example of this and we wish her well with her studies at Oxford this year. Last Friday 2 February, The College and the Old Ignatians’ Association welcomed the Class of 2016 and 2017 back to the College for a BBQ and a catch up with their classmates, past Teachers, OIA Committee members and Old Ignatian Sporting Club Representatives. 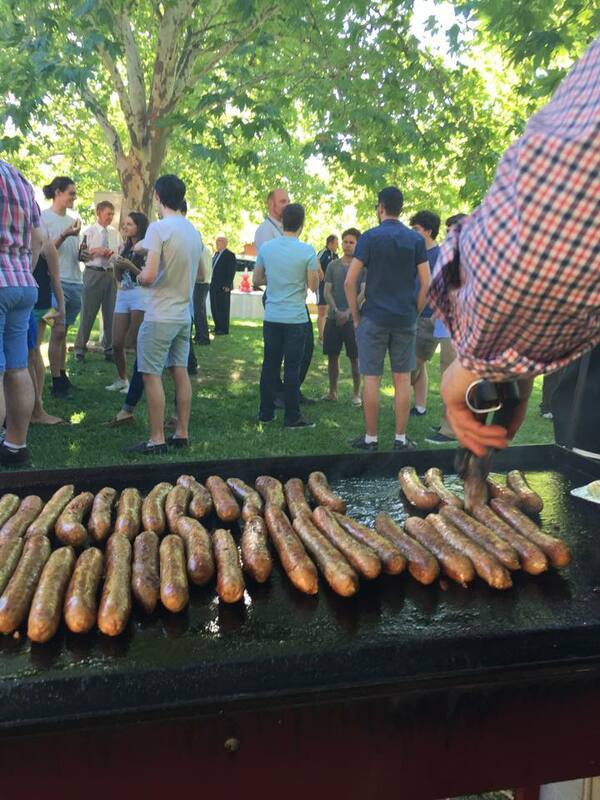 The weather was stunning and the sausages were delicious - Thank you to all who came! The OIA would like to congratulate Old Ignatian and Current Parent, Chris Howie (Class of 1986) who was awarded the Ambulance Service Medal in the 2018 Australia Day Honours list. 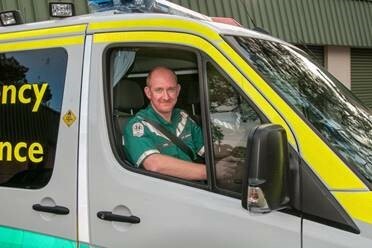 "Chris is a dedicated professional who has contributed to many successful programs, new services and public awareness campaigns, all aimed at improving ambulance services for the community, the safety of our staff and significantly improving the management for the physical and psychological wellbeing of staff. His exceptional commitment, passion, strong advocacy and support for the service and its staff is impressive. As an Operational Manager and practicing Paramedic he has provided exceptional service and is much respected and admired by colleagues, peers, emergency and health agencies." 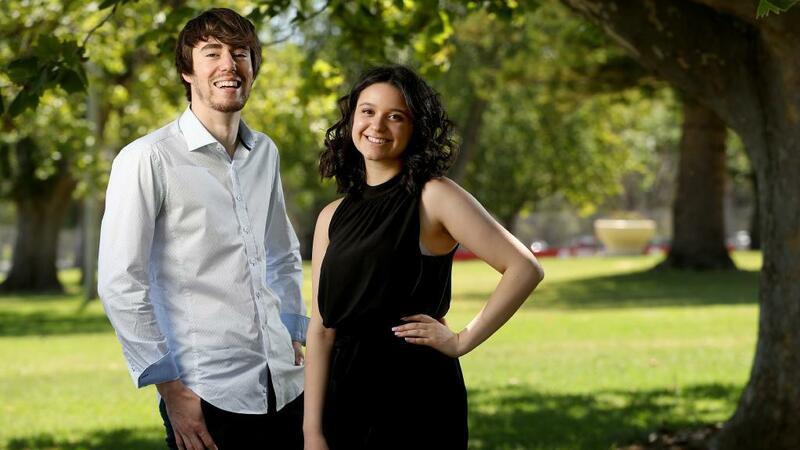 Congratulations to Cassandra Larobina who revived Six-merits and a 99.95 score, the highest possible score from the 2017 SACE results, along with Ben Fitzgerald from St Michaels College. Innovation all the way for our Old Ignatians, Jack Warhurst (Class of 2008) and Abby Willoughby (Class of 2003) and her Husband Josh who are adapting their business models in response to Amazon’s entry into Australia’s $300 billion retail sector. 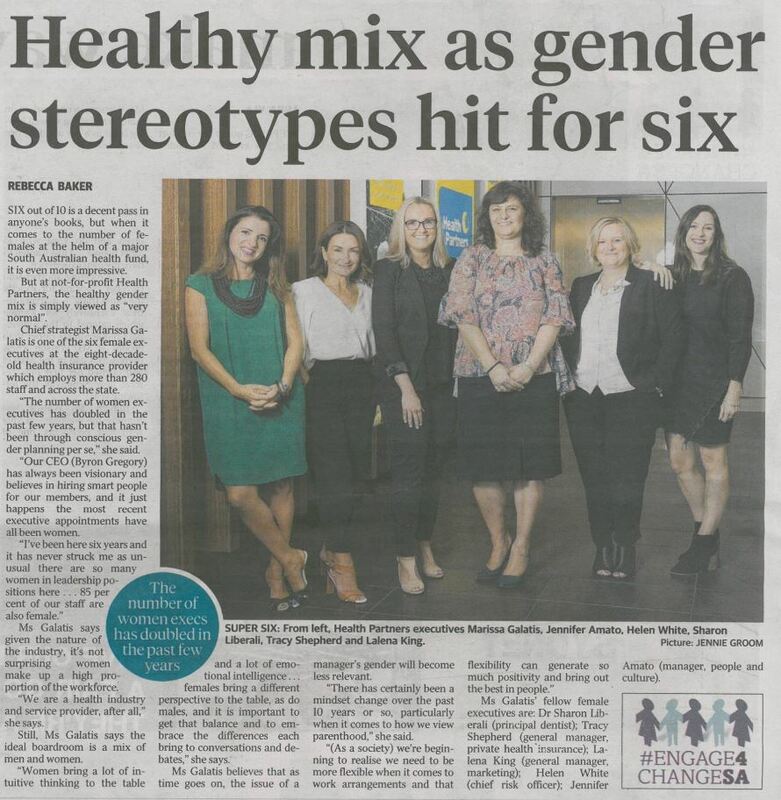 Story spotted in the Advertiser over the weekend. We would like to send a big thank you to those who attended the 30 Year Reunion for the Class of 1987 which was held at Saint Ignatius’ College, Senior School last Friday, 15 December 2017. It was a lovely warm evening and it was great to see such friendly faces sharing fond memories of their time at the College. On behalf of the Saint Ignatius' College community, we thank Fr Rob Davoren SJ and Shaun Fitzpatrick for their tireless and outstanding leadership of our College and we wish them all the very best in their future endeavors. Old Ignatian, Josh Belperio (Class of 2012). 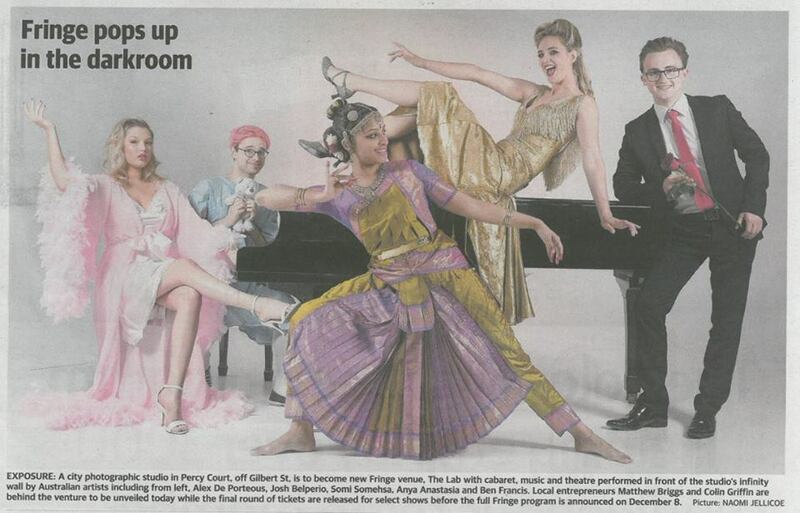 Spotted in the Advertiser on Wednesday, 15 November - Old Ignatian, Josh Belperio (Class of 2012). Spotted: Old Ignatian, Gabrielle Klingberg from the Class of 2006, was recently interviewed by Kiddo Magazine. 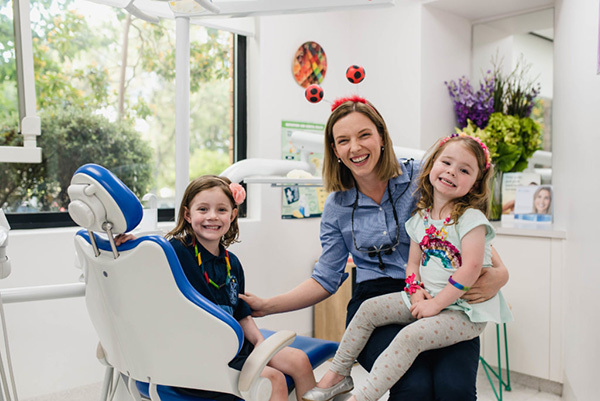 Gabrielle is a Dentist currently working at Perfect Smile on Hutt Street, so don't forget to pop in for a check up! Congratulations Old Ignatian Elaine Bensted! 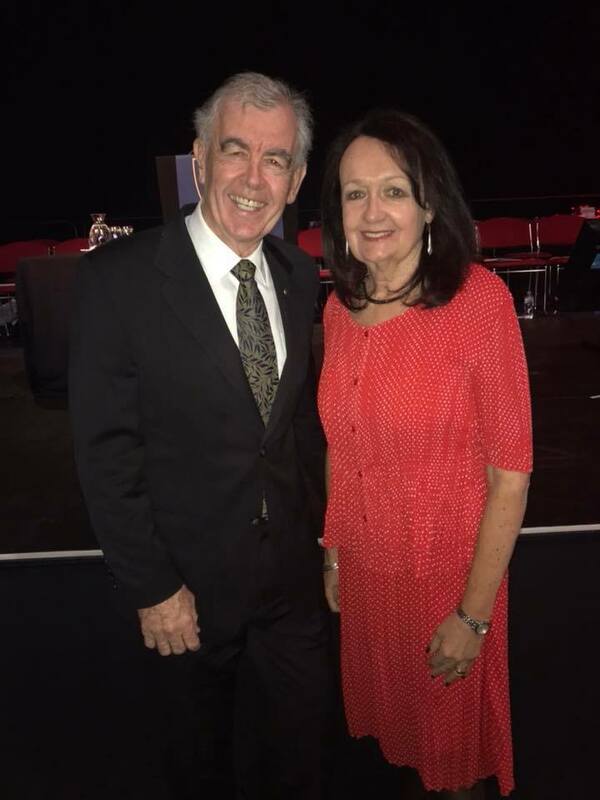 Congratulations to Old Ignatian, Elaine Bensted (Class of 1980) the Chief Executive of Zoos SA, who recently received the Telstra South Australian For Purpose And Social Enterprise Award for 2017. Elaine Bensted grew up with dreams of becoming a veterinarian. 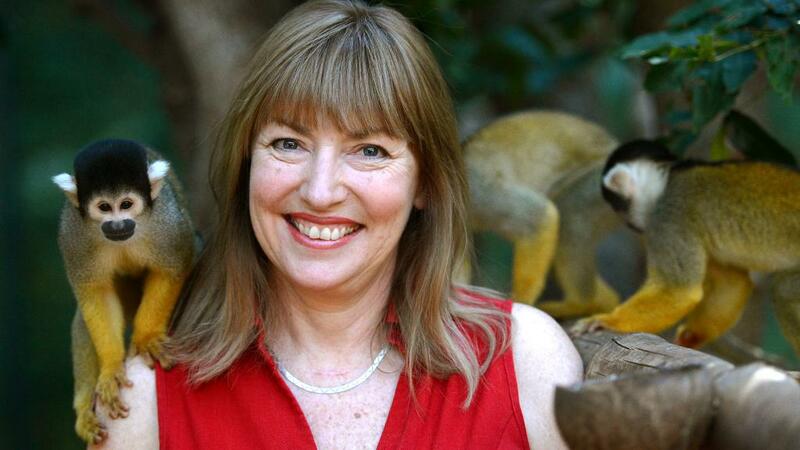 As CEO of Zoos South Australia, she plays an important role in animal conservation not just across Australia but the globe, during a time when species are being wiped out at an alarming rate. When Elaine commenced her duties with Adelaide and Monarto Zoos in 2012, Zoos SA was in a precarious financial position. Elaine’s implementation of a five-year business plan, and a 20-year master plan, has seen the organisation hit new membership records and increase its visitor numbers past half a million annually. Zoos SA is a conservation charity, so Elaine’s skills in negotiation and relationship management are essential for its efforts in preserving the animal world. The Old Ignatians’ Association would like to welcome its newest cohort to the pack - Welcome Class of 2017! 24 hours on the go! 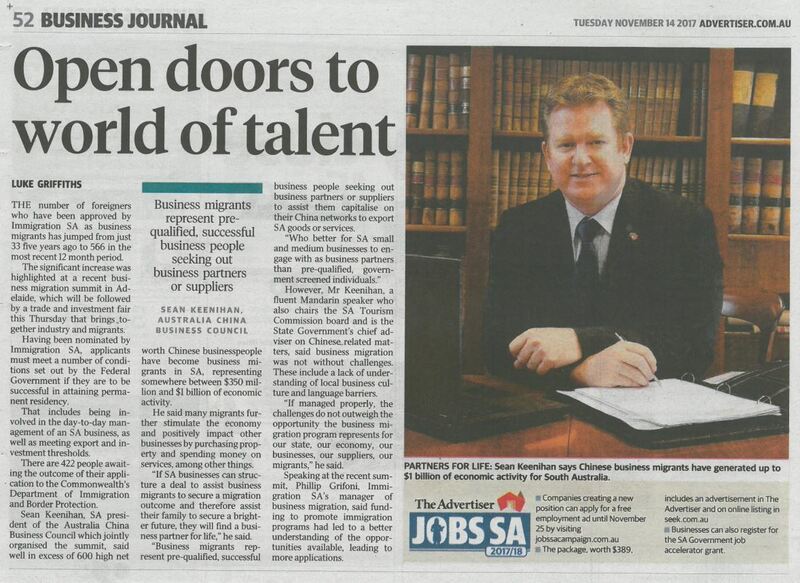 Spotted in the Advertiser Business Journal: Old Ignatian from the Class of 1988, Sean Keenihan the SA President of the Australia China Business Council. Spotted in the Southern Cross November edition: Old Ignatian Cassandra Middeldorp from the Class of 2007. Cassandra is a part of the youth choir at the Plympton Parish at St Johns Church. What a great way to stay connected and to give back to the community! Last Friday night, 10 November 2017, the Class of 2007 celebrated their 10 Year Reunion back at the College in the new Caroline Chisholm Building. What a fantastic turn out, with special appearances from some of their favourite teachers! The room was buzzing with laughter and energy amongst the Old Ignatians reliving their fond memories together. Speech Day was also a very special day for Old Ignatian, Julian Ferraretto who was awarded College Blue for his achievements in the field of Music! What an inspiration - Congratulations Julian! Julian started at the Junior School in 1981 in Year 4. His three siblings are also old scholars and in addition, his father Ennio was a well-respected teacher of Italian at the College during the 1970’s and 1980’s. In his time at the College Julian was an exceptional violinist. His talent was acknowledged through his appointment as College Music Captain in 1989. Julian went on to study at the Elder Conservatorium. Here he was the recipient of several awards including the John Robert Mitchell Violin Prize and Top Undergraduate (Jazz). In 1999 he won a South Australian Music Industry Award for Best Folk Music Act with band Aire Flamenco. Julian’s musical talents have enabled him to work internationally. He has performed at every major European Jazz Festival together with many of the UK’s most important contemporary jazz and world music bands. Locally, Julian has collaborated on arranging, recording, touring and education projects. In February 2016 he curated the first of the Adelaide Symphony Orchestra’s ‘Gigs at Grainger’ series. 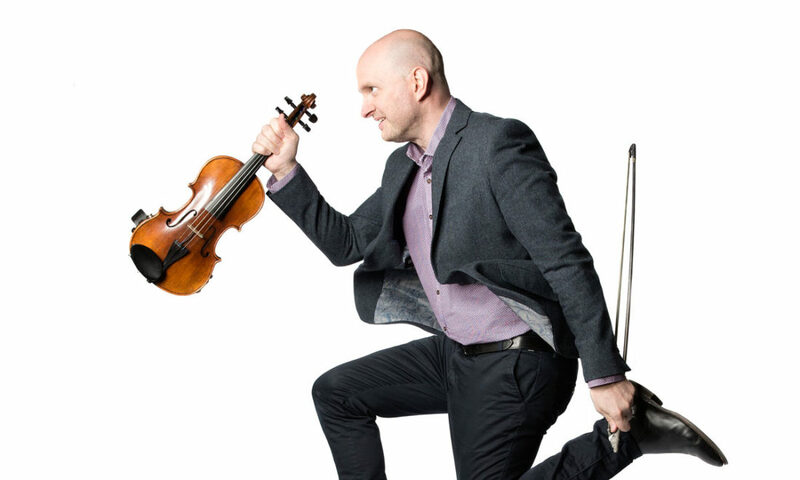 The sell-out concert, titled “Gypsy to Swing – The Journey of Jazz Violin”, saw Julian in the roles of soloist, arranger, orchestrator and composer. This year he opened the series once again composing a new suite: “Have Violin Will Travel”. This was recorded and later broadcast on ABC Classic FM. Julian’s work in education includes improvisation and creative music workshops for London Music Master’s Bridge Project, Wigmore Hall, The Adelaide Symphony Orchestra, Nexus Arts and the Adelaide Secondary School of English. Julian also works with a number of local schools to create and perform student led works. Recently as the Artist in Residence at the Junior School, where he worked with students to develop their love and passion for music. As a composer, Julian writes for film, television, radio and theatre and his works have premiered at the Sydney Opera House, The Adelaide Festival and Wigmore Hall’s ‘Time at the Bar’ series. There is no doubt that Julian’s accomplishments to date as violin soloist, arranger, orchestrator and composer make him a worthy recipient of a College Blue. Old Ignatian Dr Mark Henschke OAM was the Guest Speaker today at the 2017 Speech Day. Dr Henschke has the distinction of being the first College Captain at the Athelstone campus in 1967. For the majority of his working life Dr Henschke has worked as a rural GP/obstetrician in northern NSW. In 2006 he was awarded an Order of Australia Medal for his services to medicine as a GP and to the community of Armidale. 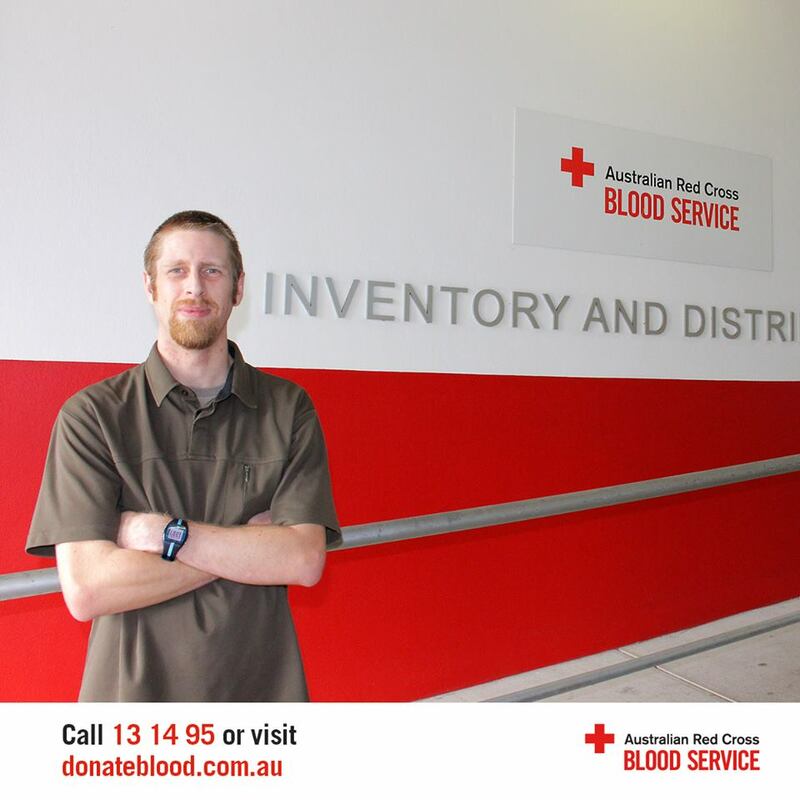 He now resides and works in Coffs Harbour where he is a senior lecturer at the Rural Clinical School (University of NSW), and maintains his clinical skills with work in the emergency department of the Coffs Harbour Hospital. 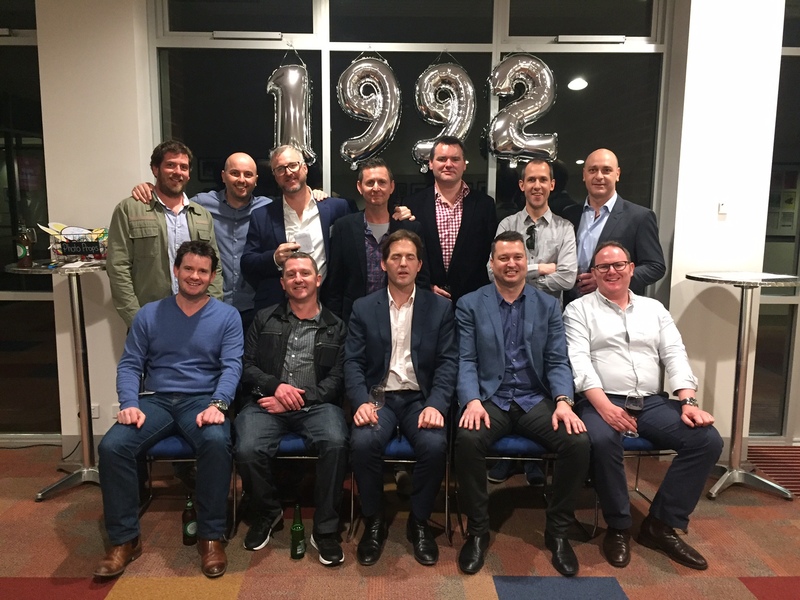 Thank you to everyone who attended the 20 Year Reunion of the Class of 1996 & 1997 held at Saint Ignatius’ College, Senior School last Friday, 27th October. What a lovely group of Old Ignatians who shared many fond memories and lots of funny stories of their time at the College. See you all again in 5 years! 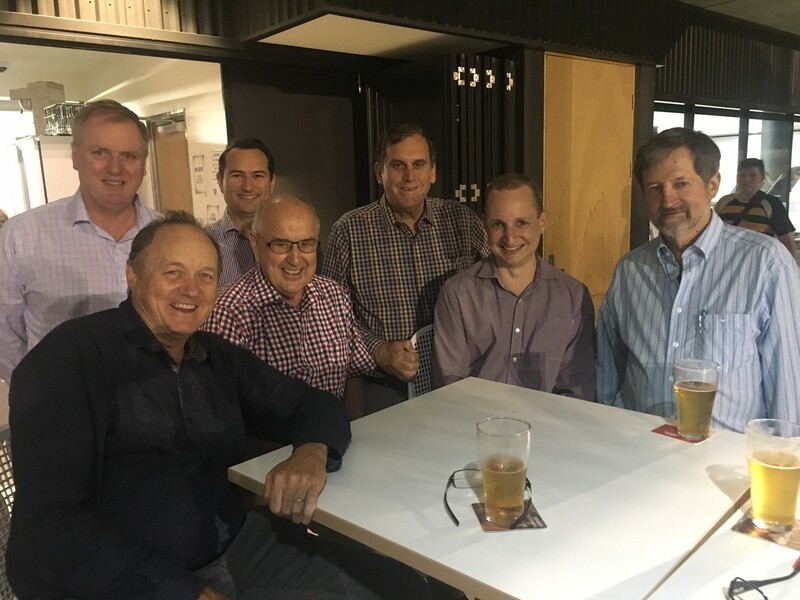 The OIA would like to thank those who attended the Brisbane Reunion which was held last night at the Western Districts Rugby Football Club in Toowong with Father Rob Davoren SJ. A great time was had by all and it was fantastic to see some new faces at the event! 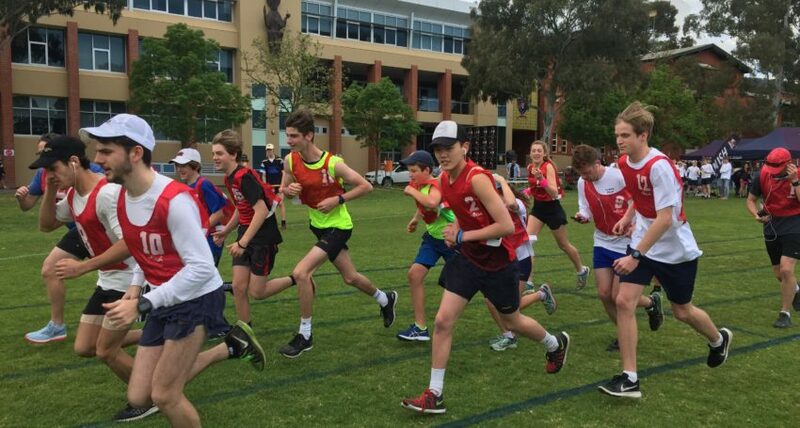 A BIG thank you to all of the runners, walkers, spectators, volunteers, sponsors and to everyone who helped us make the Brother Callil Sj 24 Hour Relay, 10 Year Re-Run the successful event it was! 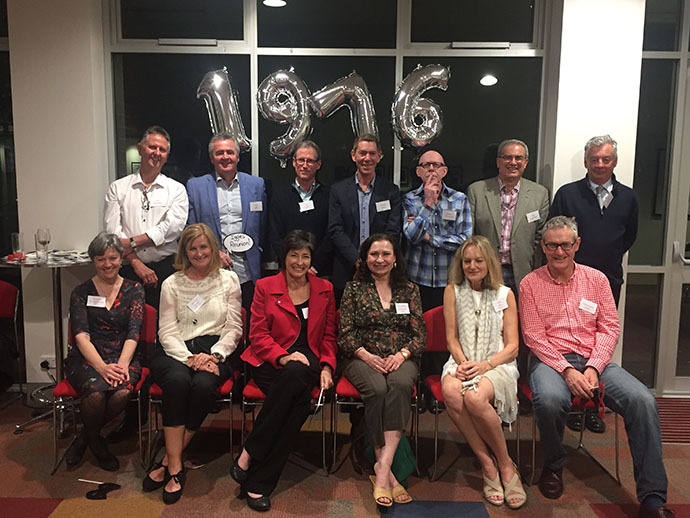 Thank you to everyone who attended the 25 Year Reunion of the Class of 1992 held at Saint Ignatius’ College, Senior School last Friday, 6th October. It was great to see the Old Ignatians that could make it and to watch everyone relive memories from their days at the College with lots of photos and even more laughs! What a lovely day! Thank you to those who attended the 50 & 60 Year Reunion on Sunday at the Junior School Campus in Norwood. The day started off with Mass at St Ignatius Church, followed by a tour of the Junior School. The Norwood Campus is where the Founding Scholars spent their time and they were very pleased and overjoyed to see just how far the College has come today. 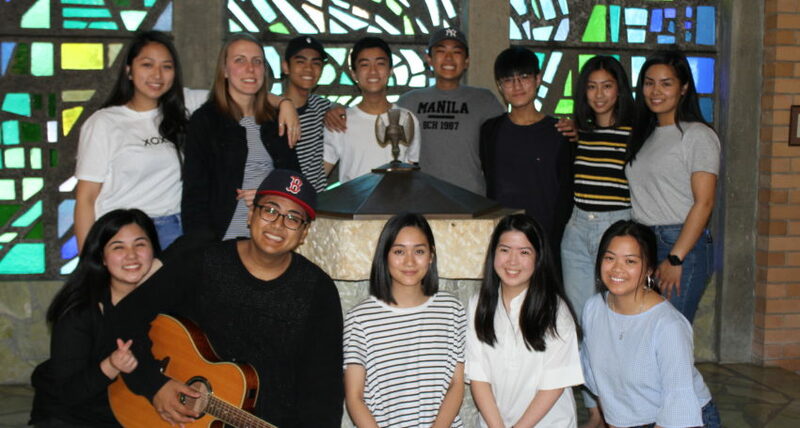 Following on from the tour, our group proceeded to the Holy Family Building for a sit down BBQ lunch, which was full of laughs and shared memories of their time at the College. Old Ignatian, Alessandro Borrello SPOTTED at Cyber Security Summer School! Old Ignatian, Alessandro Borrello (Class of 2014) was spotted at the annual Cyber Security Summer School in Tallinn, Estonia last month! 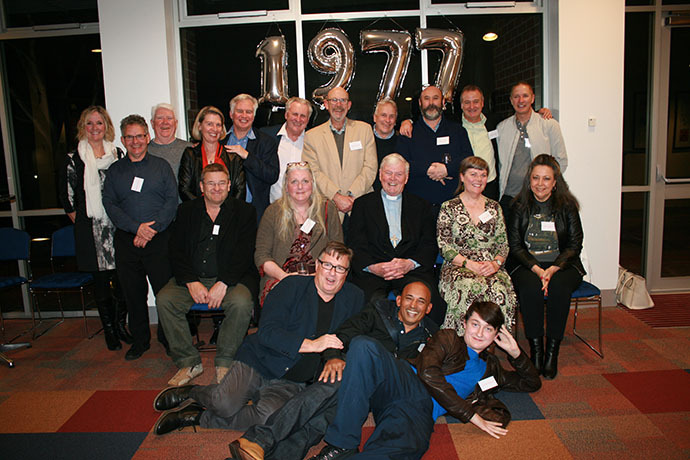 Thank you to the Old Ignatians who attended the 40 Year Reunion for the Class of 1977 which was held at the Saint Ignatius’ College Senior School on Friday night. It was great to see such friendly faces sharing fond memories of their time at the College. In addition, a very special thank you to those who travelled from interstate and to the Bishop, Greg O’Kelly SJ - Such a lovely, lively group! 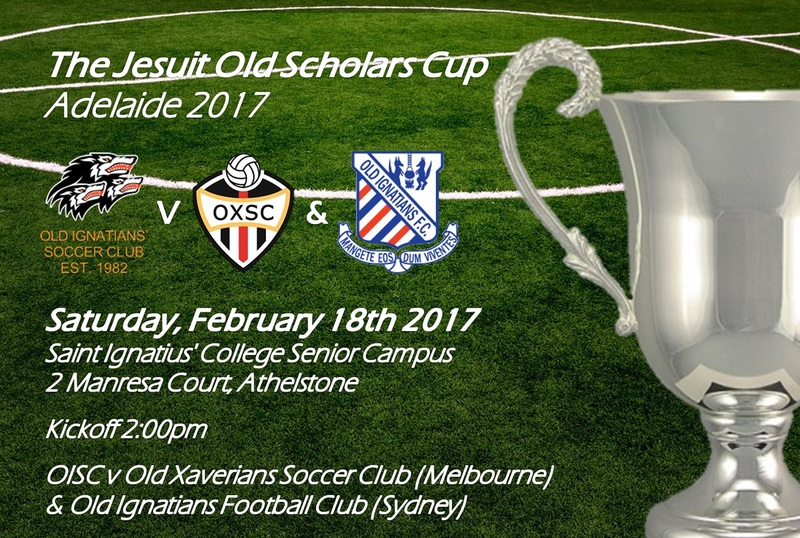 Saturday February 18th will see Old Ignatians Soccer Club play host to the 2017 Jesuit Old Scholars Cup against our brother Clubs of Old Xaverians Melbourne and Old Ignatians’ Sydney. 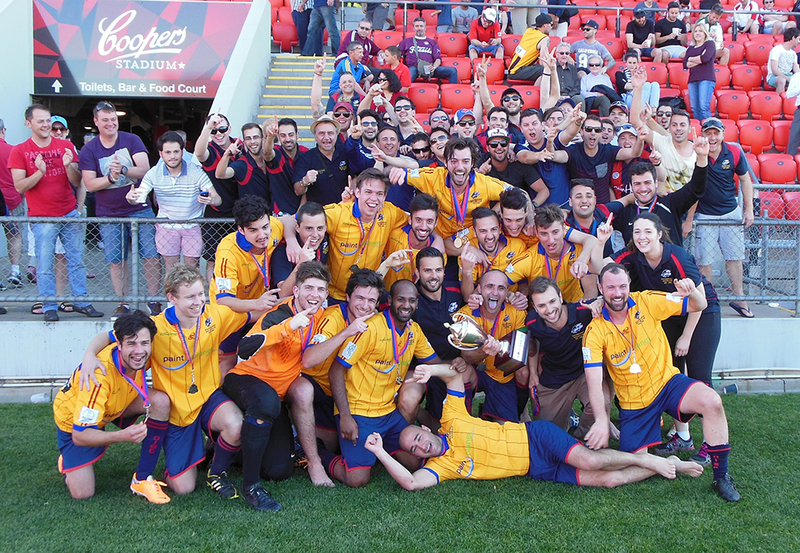 The round-robin tournament was last hosted in Adelaide in 2012 and OISC will be looking to regain the trophy from last years champions Xavier. Please come out to the Senior Campus and support us as state and Jesuit pride goes on the line!!! Last Friday 3 February, The College and the Old Ignatians’ Association welcomed the Class of 2015 and 2016 back to the College for a BBQ and a catch up with their Classmates, past Teachers, OIA Committee members and Old Ignatian Sporting Club Representatives. The weather was stunning and the sausages were delicious! Thank you to all who came. To view more images, please visit the OIA Facebook Page! 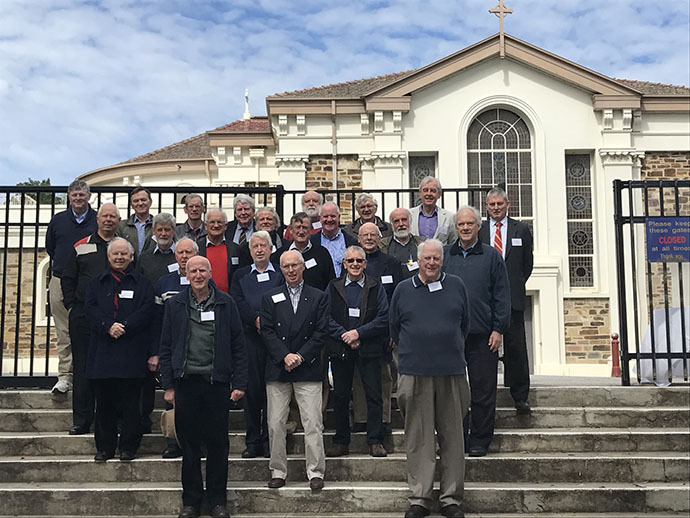 Thank you to the Old Ignatians who attended the 40 Year Reunion for the Class of 1976 which was held at the Saint Ignatius’ College Senior School on Friday, 14 October. It was great to see such friendly faces sharing fond memories of their time at the College. Such a lovely group! Since the inception of Australian Rules football in the 1850s, women have been eager to be involved. More than 100 years ago, they began taking to the field. However, their stories have largely been invisible – sidelined, ignored or forgotten. PLAY ON is a meticulously researched history of women’s football and Brunette and her co-author, Rob Hess, interviewed players from the 1940s right through to the present day about the struggles that they’ve had to face to have their game recognised by the establishment. 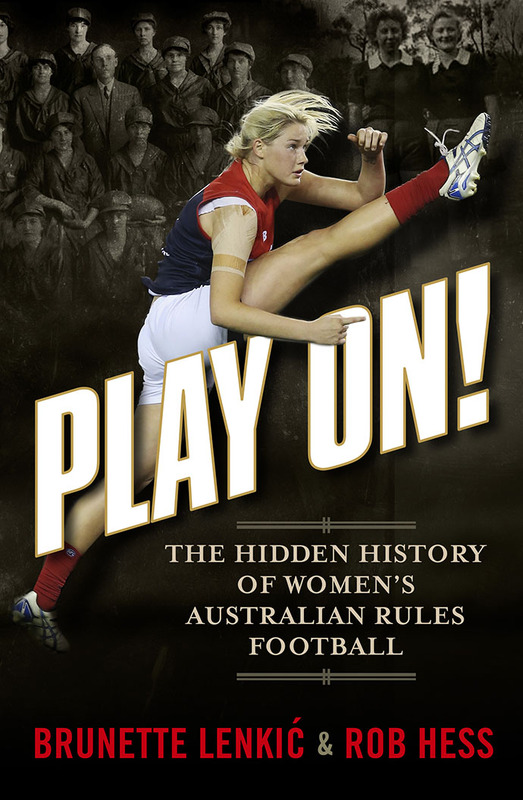 Tracing the development and popularity of the women’s game, and with the inaugural women’s league commencing in 2017, PLAY ON is a timely book that players, fans and history buffs will not want to miss. The book signing for Play On! is on Friday, 30 Sept at midday at Dymocks Rundle Mall store. 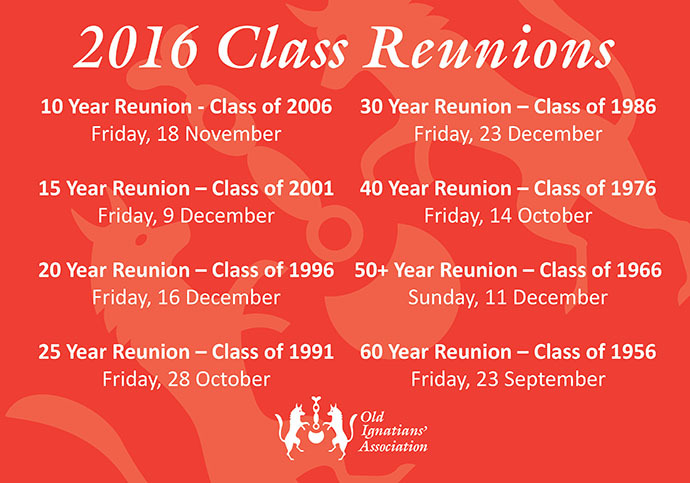 The 2016 Reunion dates how now been confirmed – Watch this space for more details! 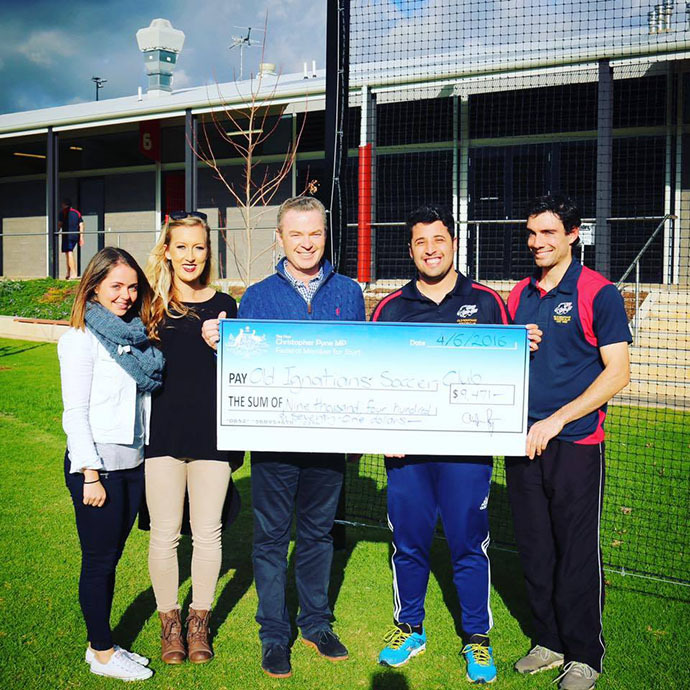 Federal MP for Sturt and Old Ignatian Christopher Pyne (Class of 1984) presenting OISC with a cheque for the new backnets at Glenunga which were funded in part through the Commonwealth Government's Stronger Communities Grant Program. 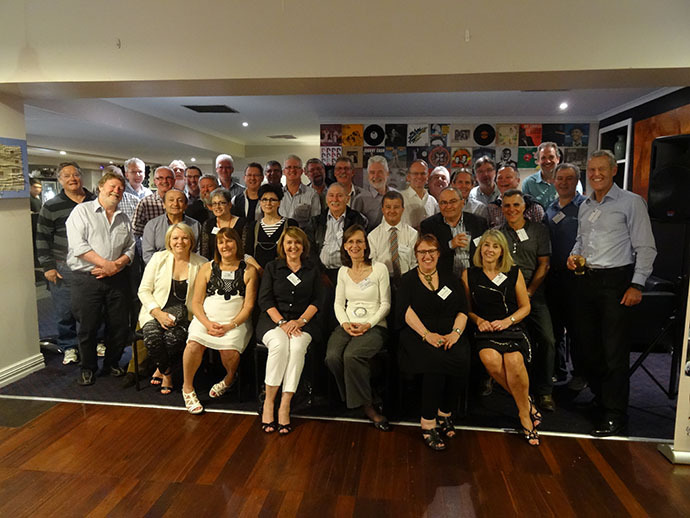 We would like to send a big thank you to those who attended the 30 Year Reunion for the Class of 1985 which was held at the Grace Establishment on Saturday the 19th of December 2015. It was a lovely warm night, filled with lots of reminiscing and photos. Thank you to the Class of 1995 who celebrated their 20 Year Reunion on Friday the 27th of November 2015 held at the Grace Establishment. Thank you to everyone who attended the 25 Year Reunion of the Class of 1989 + 1990 at the Grace Establishment last Friday 20th November. It was great to see the Old Ignatians that could make it and to watch everyone revive memories from their final days at the College with lots of photos and stories! 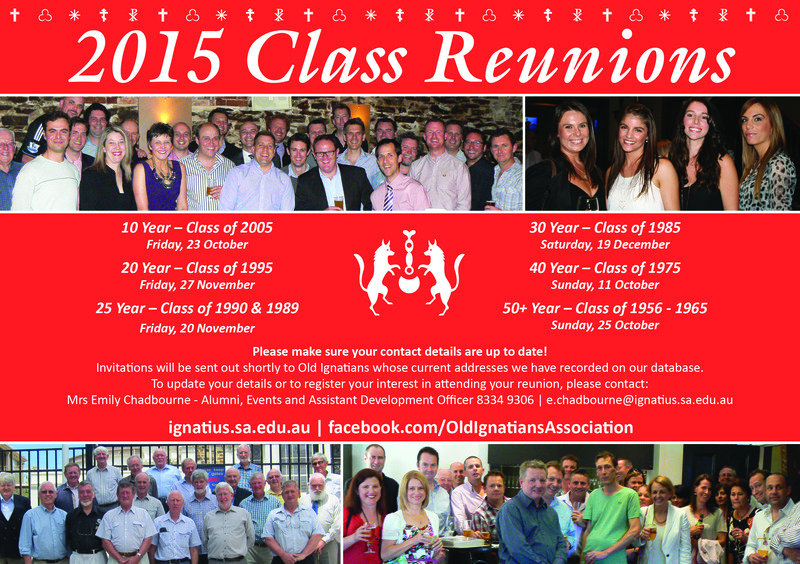 A BIG thank you to those who attended the 50+ Year Reunion of the Class of 1956 – 1965 held on Sunday, 25th October 2015. It was a great turn out - The day consisted of Mass and a College tour, followed by a sit-down Lunch at the Kensington Hotel. It was terrific to relive the College memories with a School tour of the Junior Campus again where they all studied and to revisit old tales from back in the day. The weather was lovely and the Founding Scholars had a great time! See you all next year! Friday night the Class of 2005 celebrated their 10 Year Reunion at the Grace Establishment. What a fantastic turn out, with special appearances from teachers who taught the cohort! Lots of funny stories were told and memories relived. Thank you to the Old Ignatians who attended the 40 Year Reunion for the Class of 1975 held at the Robin Hood Hotel yesterday. It was great to see such friendly faces sharing fond memories of their time at the College. 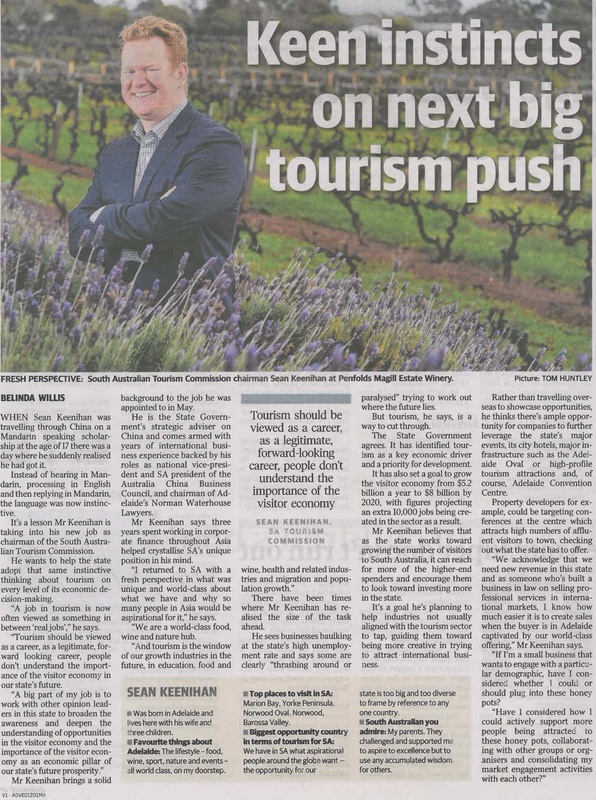 Spotted: Old Ignatian and South Australian Tourism Commission chairman, Sean Keenihan (Class of 1988) talking about tourism in our own backyard. Round sixteen and Ladies day sponsored by the Old Ignatians’ Association. 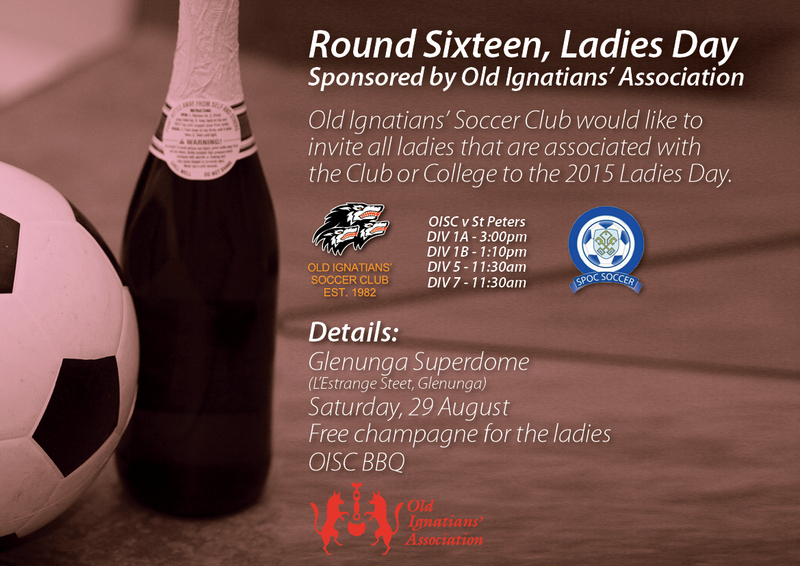 Old Ignatians Soccer Club, Round sixteen and Ladies day sponsored by the Old Ignatians’ Association. Saturday, August 29th all of the men’s sides will be playing their traditional rivals St Peters on home ground. This year it is a bit bigger than past years in that all fourth sides are also scheduled to play each other on the same day! The home fixture also doubles up as the Clubs Ladies day, so the OISC would like to invite all ladies that are associated with the Club or theCollege to the 2015 Ladies day. Come and support the Club, bring your friends, partners, girlfriends, wives and mums and have an awesome day! Well Done Dave on your excellent work! 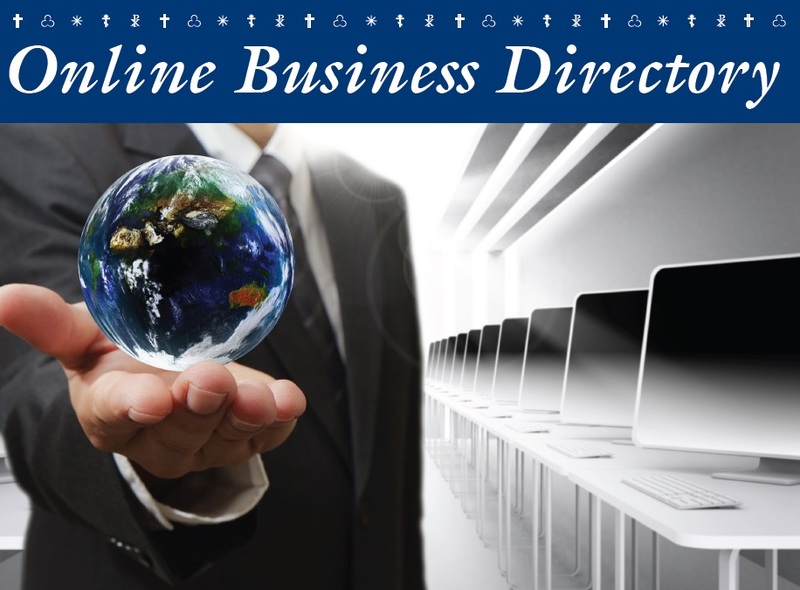 The Saint Ignatius’ College Online Business Directory provides an opportunity for Old Ignatians, and current and past parents to promote their business and to connect with the greater College community. We hope this directory will be a point of reference for all, to support and promote these businesses where possible. There is no cost of inclusion for this directory; however, to be featured you must be an Old Ignatian or current parent or past parent of the College, and own or be a partner in the business being promoted. On Saturday 23 May the 2015 Senior Formal was held at the Hilton Hotel. 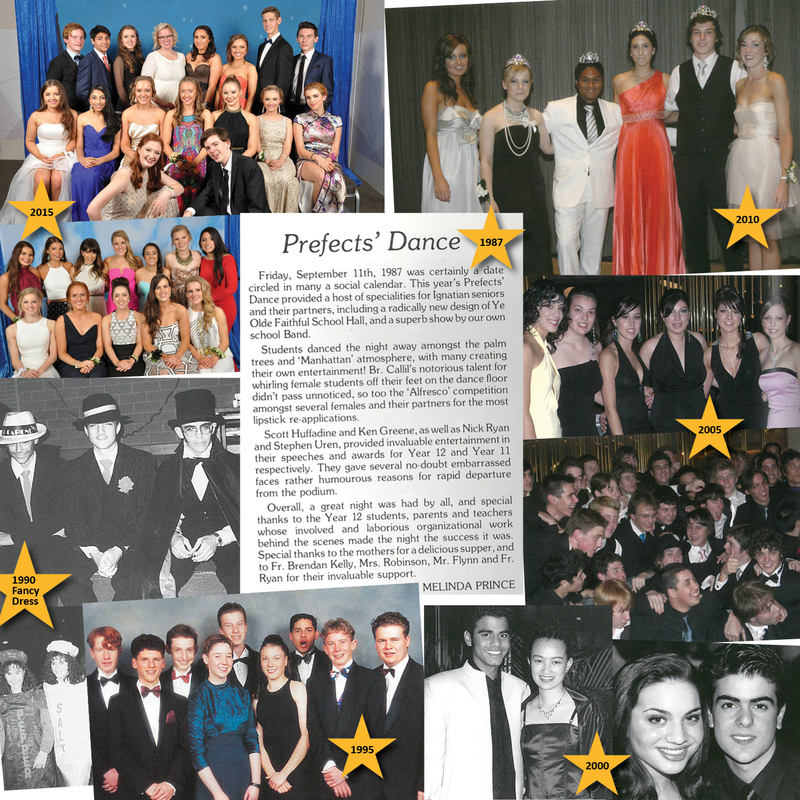 We thought we'd take a look back in time to the Ignatius Formals and Senior Dances of the past. My how they've changed! 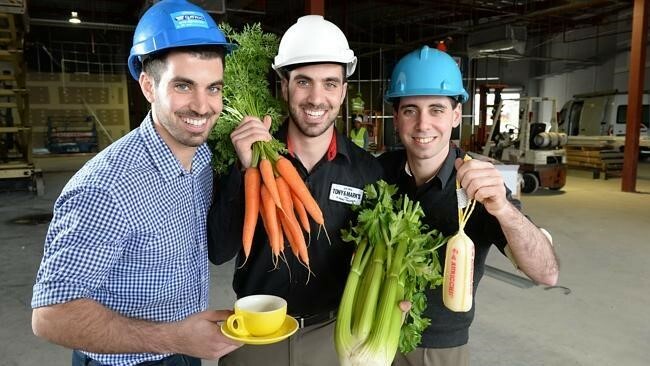 College Family, the Capobianco's are opening up another Tony & Marks which will feature a gourmet deli, florist and cafe in the new shopping precinct at old Brickworks Markets site. Pictured are Old Ignatian brothers, Paul (Class of 2007), Michael (Class of 2007) and Frank Capobianco (Class of 2006) in the new site. For more information, please CLICK HERE or to visit the Tony & Marks Website, please CLICK HERE. Old Ignatian Daniel Grilli (Class of 2007) graduated last week from the University of Adelaide’s winemaking degree as dux of the year. 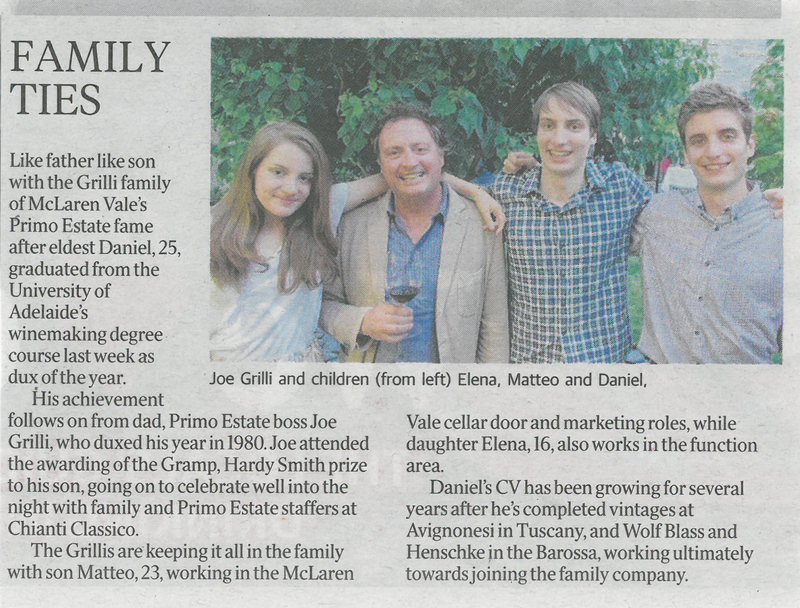 His Father, owner of Primo Estate Joe Grilli, was also dux in 1980 for the same course! Pictured with Joe are his children who also work in the family business, Elena (Current Student), Matteo (Old Ignatian, Class of 2008) and Daniel. 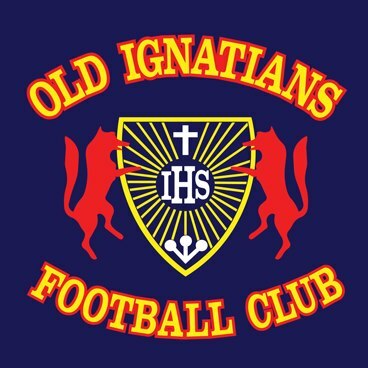 Support the Old Ignatians Football Club as they take on Flinders Park - Saturday 25th of April on home turf at the Saint Ignatius’ College Senior School, Bourke Oval. Make a day of it with friends, Grab a drink and bite to eat and a friendly chat with some of the Old Ignatians’ Association Committee Members and check out the latest OIA merchandise that will be on sale. Come and cheer the boys along this weekend and get ready for an awesome game! 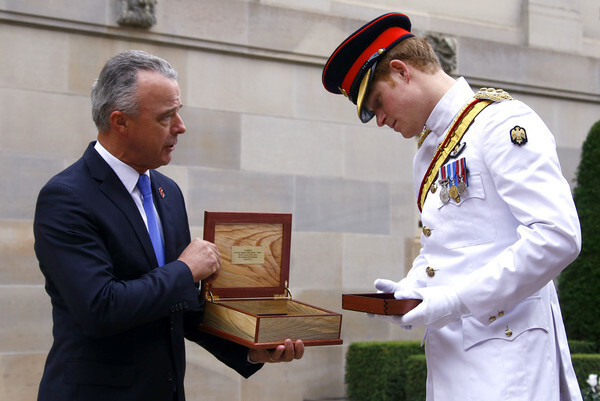 On Easter Monday, Old Ignatian and Director of the Australian War Memorial, Brendan Nelson (Class of 1975) presented Prince Harry with a gift during a visit to the Australian War Memorial in Canberra. Prince Harry, or Captain Wales as he is known in the British Army, will end his military career with a month long secondment to the Australian Defence Force in barracks in Sydney, Perth and Darwin. The OIFC will be holding their Annual Family Day Luncheon and Player Auction on Sunday, 12 April to launch the 2015 season. Players, parents, friends and all supporters of our great club are welcome! Tickets are $35 and include a delicious 3 course lunch, drinks will be available at the bar and entertainment provided for children. Please join the OIFC in launching what they hope will be another monumental season for the club. 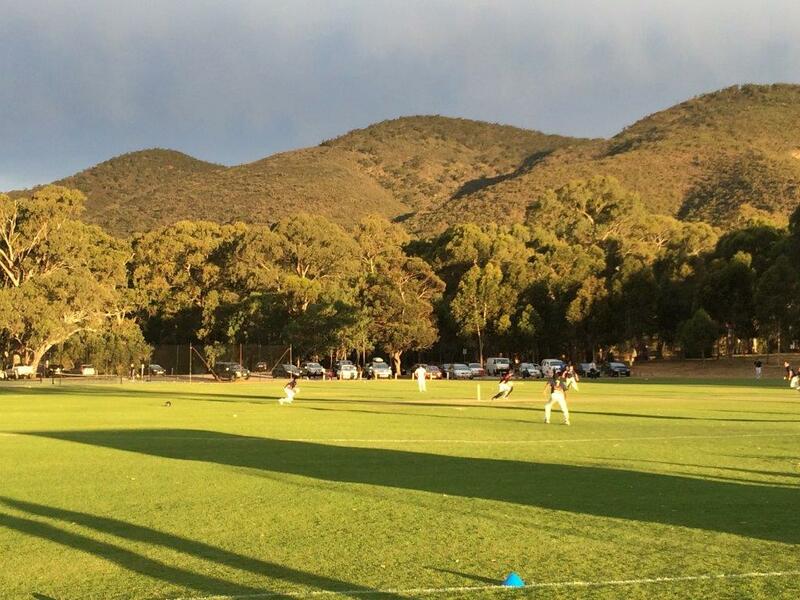 Cheer on the Old Ignatians’ Cricket Club this weekend! 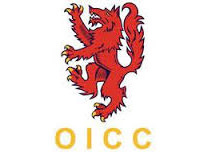 The Old Ignatians Cricket Club (OICC) A Grade team has made the finals for the first time in 5 seasons! They will play against Grange this weekend at Grange Oval #1 on Saturday and Sunday from 1:00pm with a number of Old Ignatians on the team which is a great sign for the future. Come and cheer the boys along this weekend and get ready for an awesome game! Have you got an interesting job? 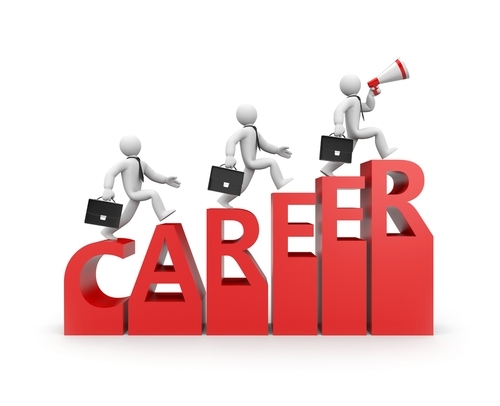 The College are currently in the midst of organising the annual Careers Market and are on the lookout for interesting careers to help current students think outside the square! 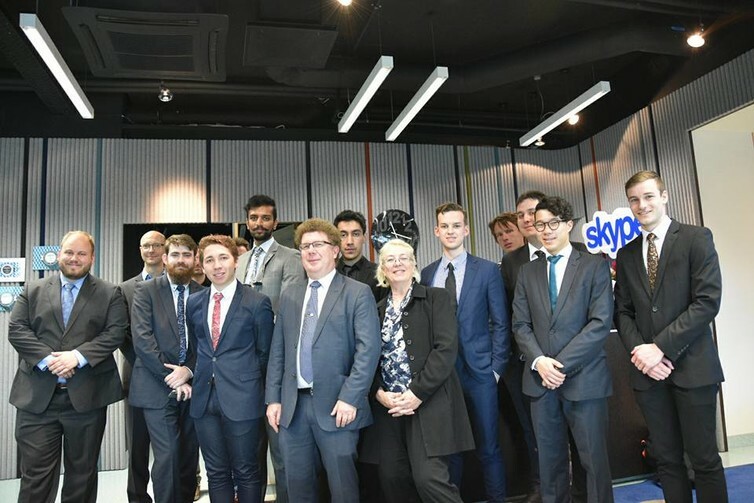 They are especially looking for careers in IT, media, digital industries, fashion, advertising, health, law, commerce and mining. ​Congratulations to our Old Ignatians who received Australia Day Honours this year. Well done on your outstanding service. Mr William Sinclair SMITH (Class of 1979) was awarded a Member (AM) in the General Division for significant service to the law particularly through international justice tribunals and human rights organisations. Mr Anthony Garry McDONALD (Class of 1959) was awarded a Medal (OAM) in the General Division for service to the community of the Adelaide Hills. 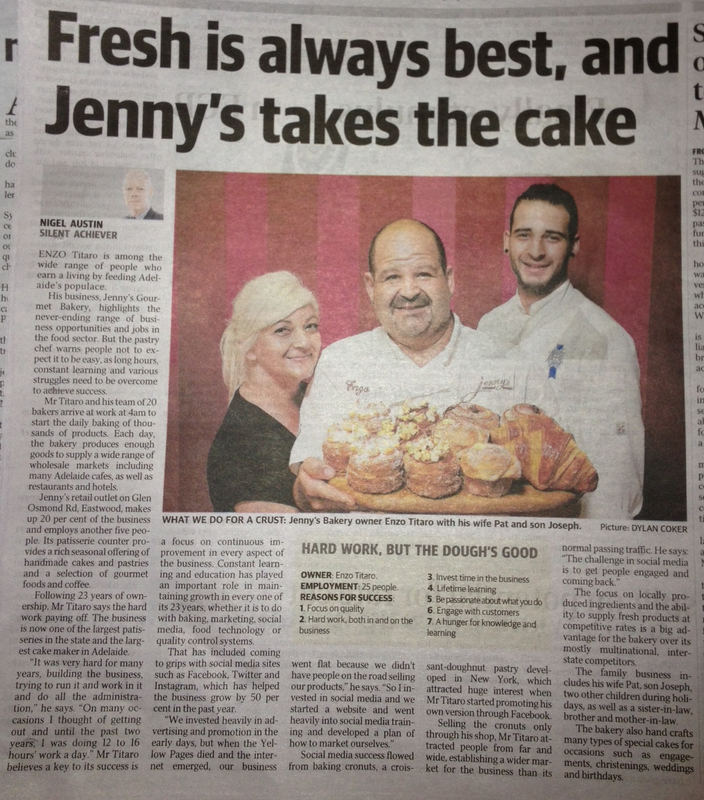 It’s an early morning for the Titaro family at Jenny's Gourmet Bakery, but their hard work is definitely paying off! Pictured are Enzo and Pat Titaro, current Saint Ignatius’ College parents, along with their son, Old Ignatian Joseph (Class of 2012). 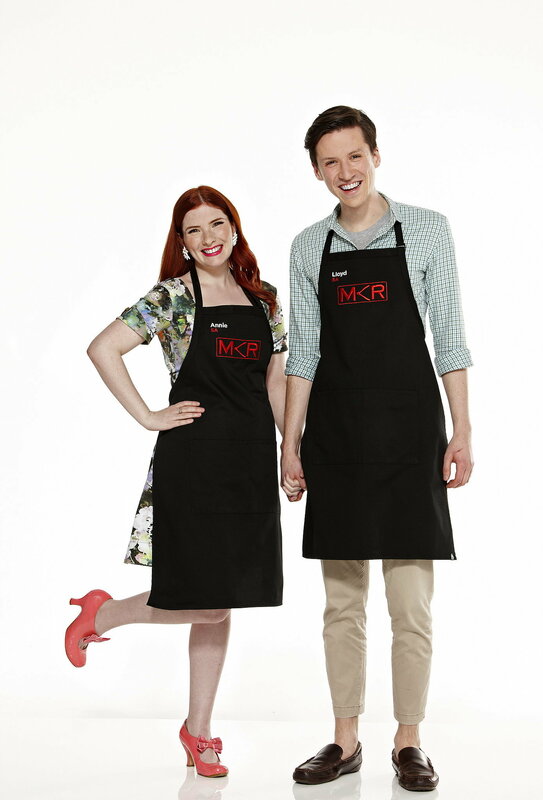 Get your aprons out and cheer on Old Ignatian Lloyd (Class of 2008) and his partner Annie on My Kitchen Rules this year! 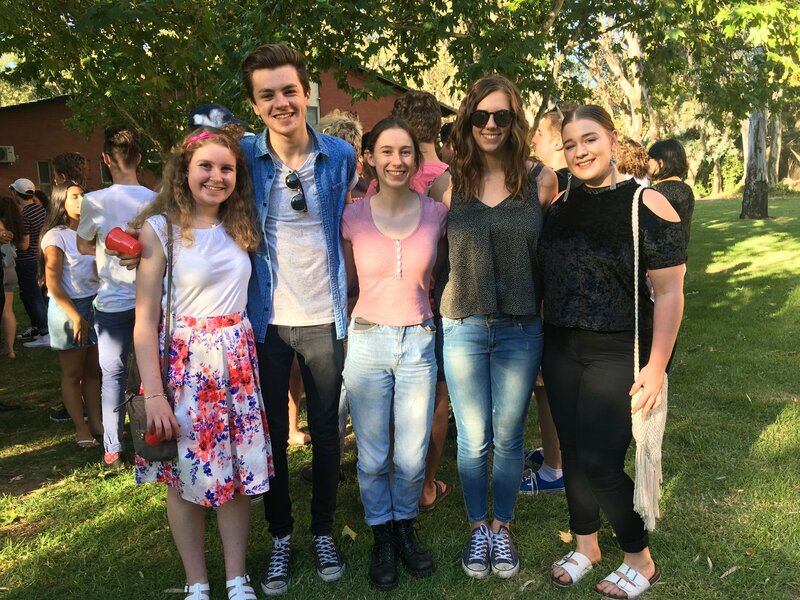 On the 30th of January 2015, the College and the Old Ignatians’ Association welcomed the Class of 2014 and 2015 back to the College for a BBQ and a catch up with their classmates, past teachers, OIA Committee members and Old Ignatian Sporting Club representatives. The weather was stunning and the sausages were delicious! Thank you to all who came. 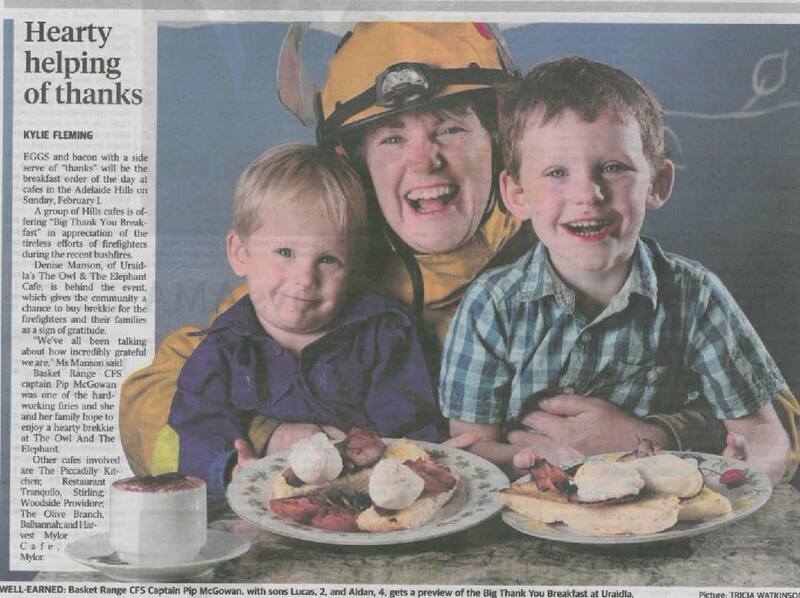 Pictured in this article from the Advertiser last weekend is Old Ignatian and Basket Range CFS Captain Pip McGowan ('87) and her sons enjoying a complimentary "thank you" breakfast put on by a group of the local hills cafes. Well done and thank you to all that helped out! 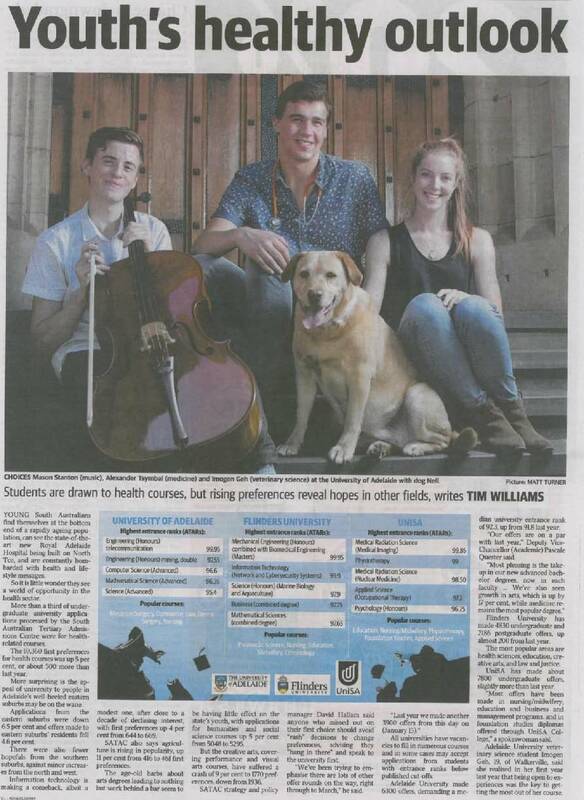 Spotted: Old Ignatian Alexander Tsymbal ('13) on the FRONT PAGE of the Advertiser last Friday! Alexander is currently studying Medicine at The University of Adelaide. Congratulations to Old Ignatian Ruby Chew ('04) who was recently one of the recipients of the Ruth Tuck Visual Arts Scholarship, which will see her traveling the world this year to develop her skills. After losing the toss and bowling first last night, the Old Ignatians Cricket Club (OICC) were set 102 to win, but narrowly lost in a nail biter, and in fading light, by 2 runs after needing 7 runs from the last over. A youthful OICC side really pushed a high calibre Hectorville team (rumoured to have an ex junior Sri Lankan international) and drew many positives from the performance. Thank you to the OICC for letting the OIA host a BBQ at the match and hopefully this will now lead the path for many more Old Ignatian Sporting Club and OIA opportunities to come! The Founding Scholars of the College were up at the Senior School on Sunday the 16th of November to participate in Mass with Bishop Greg O'Kelly SJ and Father Rob Davoren SJ. This was followed by a campus tour and then they had a lovely catch up over morning tea. This group spent their time at the College at the Norwood Campus but they were very pleased and overjoyed to see just how far the College has come today. For more images of this event, please visit the OIA Facebook page. On Saturday the 15th of November the Class of 1963 and 1964 enjoyed a grand catch up over a three course meal at the Maylands Hotel, where many interesting and varied stories were told about their shared time at the College. Thank you to those who attended. 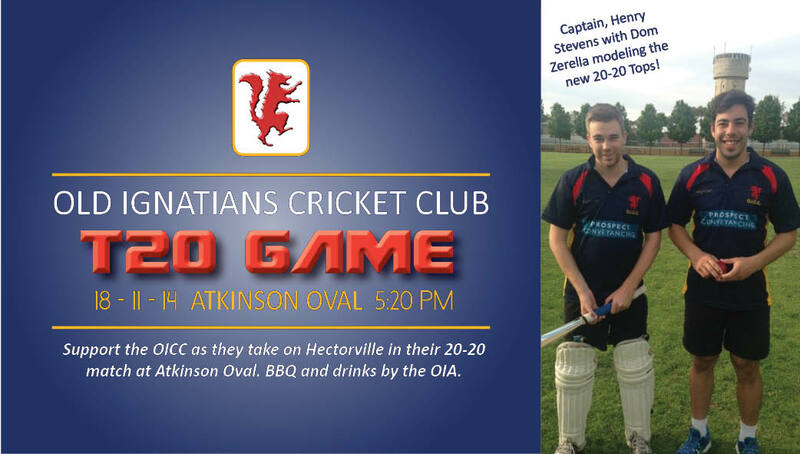 Support the Old Ignatians Cricket Club as they take on Hectorville in their Twenty20 match on November 18 at Atkinson Oval (Senior School). Make a night of it with friends. Grab a drink and bite to eat at the BBQ hosted by the Old Ignatians' Association and check out the latest OIA merchandise that will be on sale. Henry Stevens (Class of '11) will captain the Old Ignatians side with the likes of Dom Zerella (Class of '13), Nathan Carey (Class of '13) and Lachlan Collins (Class of '11) all set to play as well. Be sure to come along and cheer them on! To learn more about the Old Ignatians Cricket Club visit their website or Facebook page. On Sunday 21st September, the Old Ignatians Soccer Club played off in its first Cup Final since 2009. Their opposition was Elizabeth Downs, a powerhouse from the Sunday Division 1 league and interestingly, the same team OISC faced back in 2002 in the Cup Final. OISC were victorious on that day and two members of the 2002 squad again suited up for Sunday’s final; Old Scholars Ryan Dew (Class of 2000) and Shaun George (Class of 2001). 2014 has undoubtedly been a disappointing season for the soccer club, but Sunday’s 6-1 thrashing allowed the club to finish the season on a high. The winning cup squad featured a host of Old Scholars and was coached by former College Captain Daniel Rossi (Class of 2004). Congratulations must go out to all involved with victory. Special thanks also to the hard working OISC committee and the supporters who came out to support the side. Old Ignatian, Martin Haese from the Class of 1983 is featuring in the latest issue of the SA Life magazine as he is currently in the running to become the Lord Mayor of the City of Adelaide. We wish Martin all the best in his endeavours. 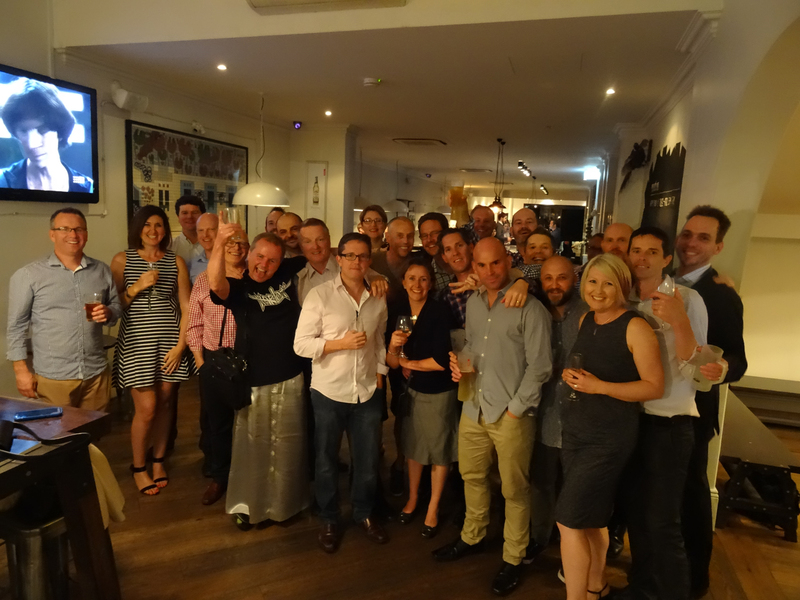 Thank you to those Old Ignatians from the Class of 1994 who came to the 20 Year Reunion held at the Duke of York Hotel on Saturday. It was a lovely long overdue catch up in the sunshine on the balcony where stories were told and many laughs were had. Thank you to the Old Ignatians who attended the 40 Year Reunion held at the Old Ignatian owned Whitmore Hotel on Friday night. It was great to see such a wonderful turn out especially those who made the trip from interstate and overseas to see old friends and to catch up over specially selected 70’s music! See you all next time!